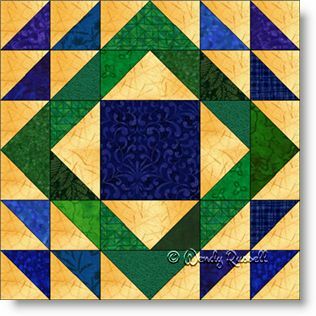 The Mother's Favorite quilt block might be one to choose if you are an experienced quilter. This is simply because there are a lot of pieces in this nine patch block -- not that the patches are difficult, but until you have mastered an accurate quarter inch seam allowance, you might rather choose a simpler block. If you are up for this challenge, you are probably already familiar with the two featured patches -- the half square triangle unit and the flying geese patch. These two patches are the first pieced patches that you learn to make, when you begin your quiltmaking journey. This block is a scrappy version, using two different colourways. However, you could use only three fabrics or make it a totally scrappy block, with all sorts of fabrics. Just be sure there is lots of contrast in the individual patches. The sample quilts illustrated show you different ways you can choose to lay out the block in your own quilt -- or you can easily create your own method. Enjoy!